The Red-tailed Hawk is one of the most widespread and commonly observed hawks in Tennessee. It frequently perches in trees along roadside and is more likely to nest in wooded residential neighborhoods than other hawks. The breeding range of the Red-tailed Hawk extends across North America from Alaska to Florida and southward to Panama and the Caribbean. It is found in Tennessee year round and migrants from the northern parts of the range join resident birds in winter. Description: The Red-tailed Hawk is extremely variable in appearance across North America with light and dark forms. Tennessee birds look like the most common eastern form with a pale chest and dark band across the belly, and a reddish unbarred tail. In flight, wings are long and broad with a dark bar on the leading edge. During their first year, birds have a streaked brown belly and brown tail with several dark bars. Males and females look alike, but as with most birds of prey, the female is larger. Voice: The call is a distinctive descending raspy scream, kleeyeeeeer. Red-shouldered Hawk has a black and white banded tail and appears more uniformly colored. Habitat: Found in open areas with scattered elevated perches including near agricultural areas, pastures, parkland, and open woodland. Commonly seen perched on telephone poles and trees along roadsides. Diet: Small to medium sized mammals, birds, and snakes, with occasional insects and fresh carrion. Nesting and reproduction: Red-tailed Hawks rarely breed before their second year. They form long-term pair bonds that usually last the life of the birds. Males and females perform a courtship ritual in which they dive and roll in the sky. They may lock talons and fall towards the ground before splitting apart. Clutch Size: 2 to 3 eggs, rarely to 5. Incubation: Both adults incubate for about 34 days. Female generally does all of the brooding of the young, while the male supplies her and the young with food. Fledging: The young start climbing branches near the nest after 42 to 46 days and leave the nest after 9 weeks. They will remain with their parents for up to 10 more weeks. Nest: The large stick nest is built by both adults and is usually placed in a large tree in an open area. Nest material is added in subsequent years and nests can reach a diameter of over 3 feet. Nest heights range from 25 to 100 feet above the ground, with an average height of 65 feet. 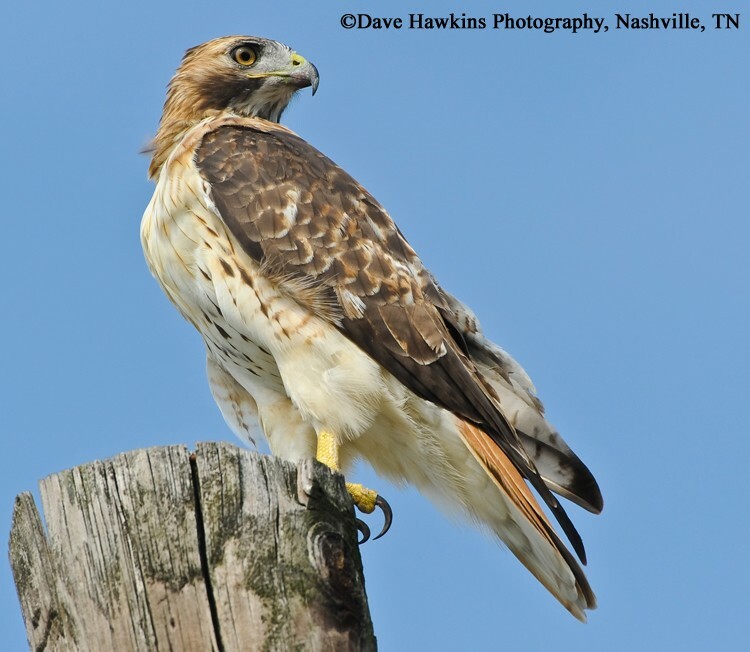 Status in Tennessee: The Red-tailed Hawk is a common, permanent resident statewide. In winter the Tennessee breeding population is augmented by an influx of more northern nesting birds. Maximum numbers occur in the state from November through March. The population is stable or increasing in Tennessee. Filmmakers frequently use the cry of a Red-tailed hawk to represent any hawk or eagle anywhere in the world. The oldest record for a Red-tailed Hawk in the wild was 28 years 10 months. 85 to 90% of the Red-tailed Hawk's diet is composed of small rodents. Red-tailed Hawks can spot a mouse from a height of 100 feet. Harlan's hawk and Krider's Hawk are names given to 2 western subspecies of the Red-tailed Hawk. Best places to see in Tennessee: Roadsides and open lands statewide. Preston, C. R. and R. D. Beane. 1993. Red-tailed Hawk (Buteo jamaicensis ), The Birds of North America (A. Poole and F. Gill, eds.). The Academy of Natural Sciences, Philadelphia, PA, and The American Ornithologists' Union, Washington, D.C.